Mail Boxes Etc. Coronado is a family run business. Michael Poirier, and Jeannine Nadeau, Canadians from Quebec took over the store from an American couple in 2007. “Those were the early days of the expat influx in the area. When we first started we had about 70 boxes and today we run at about 350”. Roughly 90 to 95 percent of MBE mail subscribers are foreigners. “The early days were hard”, says Michael, who came to Panama with their 8 year old son, Max, to take over the MBE Coronado franchise. Jeannine would stay back in Canada for another two years to finish up her work commitments and sell the family home. “I had just been laid off from my job of 25 years, Jeannine was finishing up her projects and Max was still young. When we heard about the sale of the Mail Boxes Etc franchise in Panama, we felt that it was the right time in our lives to take on a new challenge”. Having arrived in Panama on a visa which depended on the business, Michael had to fulfill many requirements on which he was not always clear about. In dealing with officials, he experienced frustration. “Nobody I was dealing with would give me all the information I needed. I would be told to get a specific document or report, and then when I would show up with it, I would be told I also needed something else. I was never sure at any time that I had everything I needed”. In many ways some of those conditions still exist for Michael and Jeannine. “It often feels like rules are flexible and negotiable” Says Michael, voicing a frustration held by many foreigners navigating Panama. 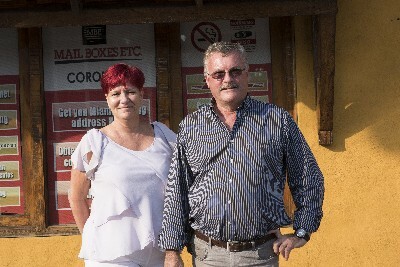 While Michael and Jeannine have improved their Spanish speaking skills in the 10 years they have lived in Panama, the language is still a barrier when it comes to business dealings. “If you don’t know the subtleties, it is easy to miss things” says Michael. For Michael and Jeannine, employee retention and customer service is at the core of what they strive to achieve. “It is not always easy to reach”, says Jeannine who drives the customer service department at the Coronado Mail Boxes etc. store. “I train my employees to do things they are not accustomed to do, such as greeting people when they enter, or acknowledging someone’s presence even if they are busy with someone else”. “It is important that employees understand the big picture”, say Jeannine, talking about how she notices that employees do a better job when they understand the logistics of the company operations. Training employees takes time and commitment. “You have to be patient” says Jeannine, “like with many things here”. Jeannie encourages employees to set personal goals. She feels a sense of fulfillment when she sees them grow and reach for something better in their lives. She feels discouraged when an employee quits or doesn’t understand what she is trying to do. Jeannine sets good examples on how to set goals and help out. It is her enthusiastic belief in her causes that naturally rally people to her side. At one time she started a fund raiser to help a local orphanage to raise money for basic supplies like beds and sinks. In a short period she raised close to $10,000 from the expat community. Another time she joined forces with the local Rotary club to successfully raise money to buy wheelchairs for under privileged individuals. Jeannine’s desire to help goes beyond helping humans, as anyone coming to the Coronado MBE store can testify. MBE feeds and tends to a small colony of cats that live outside the MBE store. A jar on the MBE counter allows clients to contribute to the feline cause. Coronado MBE goes a few extra steps paying close attention to details. “In the long run it saves time and customer frustration. Mail service can be a complex business, “there are many moving parts in play when it comes to getting a package to the client. We have to deal with duty, taxes, customs and shipping companies. We try to make these logistics invisible to the client”, says Michael. These extra efforts are likely what has earned MBE Coronado the distinction of being in the top 5 sales position out of the 37 MBE stores in Panama. “We are proud of that status and are always working towards improving our standing”. Says Jeannine. Mail Boxes Etc is located in Coronado in the Corowalk Plaza. They are open from 8 a.m. to 5pm on weekdays and 9 a.m. to 1pm on Saturdays. You can reach them at 345-3520 or by email at mbe.incoronado@gmail.com.